Anansi has been known as many things from the Sky God to the Keeper of Stories and my personal favorite, the Trickster. While many argue Anansi's origin, stories and folklore tales can be found about the Spider-God throughout Africa and the Caribbean. Anansi is sometimes depicted in many different ways. Sometimes as a spider with a human face or sometimes as a spider wearing clothes. He is even depicted human like with spider elements like having eight legs. 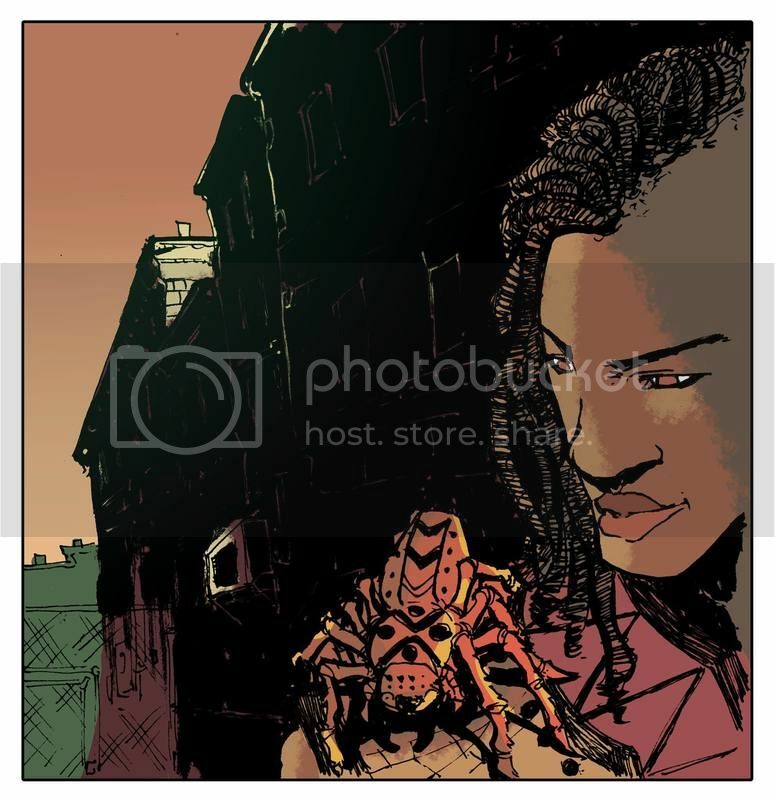 But what makes the story of Is'nana the Were-Spider different is we get to see Anansi as a father. I know, I know. Amazing isn't it? Is'nana is the son of the Spider-God and throughout the comic we get to see a bond between father and son that makes me see Anansi in a whole new light. Without spoiling too much of the comic for those of you who haven't had a chance to read it yet, the comic opens with an introduction to Is'nana. While we already know of his famous father, we get to see the world through Is'nana's eyes. He's a pretty interesting kid. It's easy to see that he's a hero whether he wants to be or not. Meanwhile, on the other side of town, something fishy is going down. One of Anansi's arch-nemesis has stepped into the human world and he isn't coming to make amends. Before I give way too much away, let's talk to the creator of Is'nana the Were-Spider and see what inspired him to create such a unique story using already rich folklore characters. 1. Besides the obvious reference to Anansi, where did the inspiration for Is’nana the Were-Spider come from and what made you decide to make it a comic? Well I’m a big fan of mythology. I taught myself Greek mythology and one of my favorite things was seeing different stories and modern versions and retellings of Greek stories and their characters. As I got older, I got interested in Black based folklore, and Anansi was one of the characters that really stood out. He is one of the original trickster figures in Black folktales and I find it very unfortunate that a lot of people have lost touch of this character. 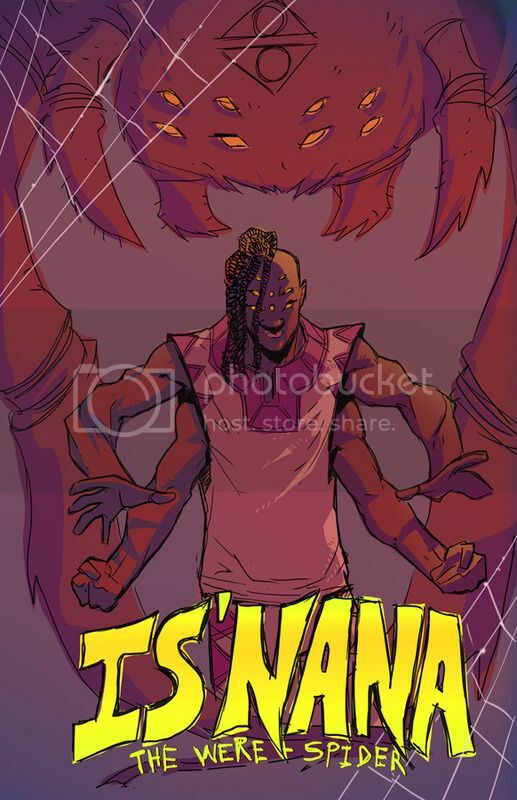 It pains me how many times I’ve asked people “Do you know who Anansi is?” And I hear, “Who?” With Is’nana, I wanted to create a character who would embody the spirit of trying to save the legacy of these Black based folktale characters and given that Anansi is the God of Stories, I felt Is’nana being his son would be the perfect fit, ensuring that his father’s legacy lives on in a world that is forgetting them. 2. Will we ever learn how Anansi got a half human, and I’m assuming half were-creature, son? Haha, well Anansi is a full god with all types of abilities. I don’t think I’ll explain too much on Anansi himself with his abilities but Is’nana is a different story. The next book may be a prequel instead of a continuation, but the prequel will explain how Is’nana came to be of this world and his being the name-sake of the title Were-Spider. 3. How did Is’nana become a Were-Spider? Is there a werewolf involved somewhere in Is’nana’s orgin? That’s being impatient, Nikki! Haha. Stay tuned, all will be explained. But no, there’s no werewolf involved. 4. Where did Osebo the Leopard come from? Osebo is from the Mother Kingdom, same as where Anansi and Is’nana are from. The Mother Kingdom is another plain, another universe or world of sorts. Osebo in the original myths is a rival of Anansi The Spider. He was tricked and defeated by Anansi as a stepping stone to Anansi’s place as the God of Stories. In this story, they’ve been enemies for centuries and he comes into our world to ensure his survival and legacy, even if he has to cause turmoil and death to do so. 5. How many comics will be in this series? I don’t have a set number yet, but I definitely want to do various one-shots similar to this one here that you’ve read or maybe a mini-series here and there. 6. How many more villains will come after Is’nana? Oh, there’s quite a few planned. Some from the original Anansi stories, so you’re ahead of the game if you know your stuff. Some brand new enemies and so on. It’s going to be fun. I’m particularly interested in seeing Is’nana up against Mmboro the Hornet and the infamous Tar Baby. Right now I'm raising money for Is’nana through Kickstarter to help with getting the book published. I was very excited and shocked to have made my goal in 2 days and the response for the book has been very overwhelmingly supportive. I'm extremely grateful. It would definitely be the best way right now for people to get a copy of the book, a printed copy s only $10! Also, I’ve already started plotting and writing a different story for Is’nana and a different and new idea in general. I’m always plotting and writing new ideas and I’m hoping I can get it out before I go crazy, haha. And still trying to finish my feature film, Heart on a Wire. 8. Are you planning to venture into novel writing anytime soon? Man, I really don’t know. As much as I love reading novels, I’m not too confident about my prose, to be honest. I’ve heard a lot of great feedback on my prose but it’s something that doesn’t excite me as much as writing a script; be it comic or play. It’s something to consider. I tend to surprise myself at times, so who knows? 9. When can we expect the next volume in this comic? Well the Kickstarter ends February 10th for this current volume. Once that happens, I'm jumping straight to finalizing the last bit of things needed to get it published and printed. I don't know when the next volume will be released but I've already been talking to my artist, Walter Ostlie, about doing the next one. A lot of the extra money raised from this Kickstarter will most definitely be used for production of Vol. 2. 10. Any words of advice for people looking to break into the comic world? Yes. Never give up. It’s a hard field to get into and it’s a struggle. You have to constantly hustle and push yourself and keep on producing. One of the main things is to make sure you get a job that will keep you afloat, and get a few other gigs also. Simply getting a small comic book out is not as easy as it seems and feels harder than it actually is. But persevere and just keep on going. Don’t let anyone or any setback discourage you. Thank you for agreeing to the interview and for allowing me the first look at the upcoming comic. It was a wild and enjoyable ride. Thank you so much for having me! And it means so much to me that you enjoyed it! As you can see, the creator of Is'nana the Were-Spider has so much more in store for us and I, for one, cannot wait. As of this posting, the Kickstarter campaign has more than exceeded its goal. That doesn't mean that we have to stop donating. In a world where people of color are often excluded, it is absolutely refreshing to find a creator of color who doesn't mind carving out a space for us. If you want a copy of this comic, the best way is through the Kickstarter campaign as the creator mentioned above. All-in-all, I give Is'nana the Were-Spider five pages (think five-stars). Nikki-Michelle recommends this comic. The Creator, Greg Anderson-Elysee is my favorite and I keep most of their products and will continue keep an eye on it. Also I have introduced them to all of my friends. I got my hands on three copies of Greg's comic book. One for myself one for my daughter and one to a friend who is a huge comic lover. No complaints here from any of us. So many great elements to the story. Can't wait for more of the backstory on the characters. I feel it will be very interesting!! Hurry with the next one. We all are on the edge of our seats.